Home / White supremacist gang members accused of meth trafficking in Arkansas, U.S.
White supremacist gang members accused of meth trafficking in Arkansas, U.S.
U.S. Attorney Cody Hiland said that a new set of indictments, in the ongoing case, were unsealed on Tuesday. They name 54 members of the ‘New Aryan Empire’ (NAE), a white supremacist organization that began as a prison gang in the 1990s. The gang made violent attempts to silence witnesses to the group’s meth-trafficking, including permanently disfiguring one person’s face with a hot knife. This group engages in drug trafficking, intimidation of a witness, violence including attempted murder, kidnapping and assault. The indictments were originally returned in October 2017, accusing 44 gang members of drug and gun crimes. In the latest charges, additional members have been named and counts have been added for their alleged involvement in violent crimes committed by their group. These crimes include kidnapping a person and attacking another with guns, bats and knives. The agents made 59 controlled purchases of methamphetamine and seized more than 25 pounds of meth, in addition to 69 guns and $70,000 in drug proceeds, during the federal and state joint investigations. “The violence and hatred alleged in this superseding indictment have no place in society,” Hiland said while announcing the new charges at a news conference in Russellville, about 60 miles northwest of Little Rock. The new indictments were returned under the federal Racketeer Influenced and Corrupt Organizations Act, which targets criminal organizations and provides for extended criminal penalties and civil action for acts performed as part of an ongoing criminal enterprise. Hiland said that the charges against the organization’s leaders and members had inflicted “significant damage” to the group that he said has trafficked “copious amounts of methamphetamine” in the state. He said additional charges are possible. Officials said the investigation was launched in 2016 following a murder involving members of the New Aryan Empire. Officials said 35 of those charged are in custody and another 16 were previously released on bond. Three others, all from Russellville, have not been arrested. Nicki Nicolo, defence attorney for Jeffrey L. Knox, who is identified in the indictment as one of the leaders of the gang, did not immediately return a telephone call seeking comment. Among other things, the indictment alleges that Knox, 43, of Russellville, was part of drug sales and the attempted murder of a suspected law enforcement informant. Authorities said Knox is in federal custody. The Gang has been described as ‘brutal’. This gang now has roughly 5,000 members. It was “founded on the principles of white supremacy,” police said. The members of the NAE are notorious for multiple crimes. In another instance, NAE members kidnapped and stabbed two individuals because they gave “information to law enforcement about another NAE member.” During the kidnapping, the victims had allegedly been forced to write apology letters to the NAE member and his girlfriend. In November last year, two white supremacist groups were busted within a week. In this particular operation, more than 80 arrests were made and a rocket launcher was seized. Such groups have been known to possess meth, fentanyl, and 110 illegal weapons including pipe bombs and a rocket launcher. 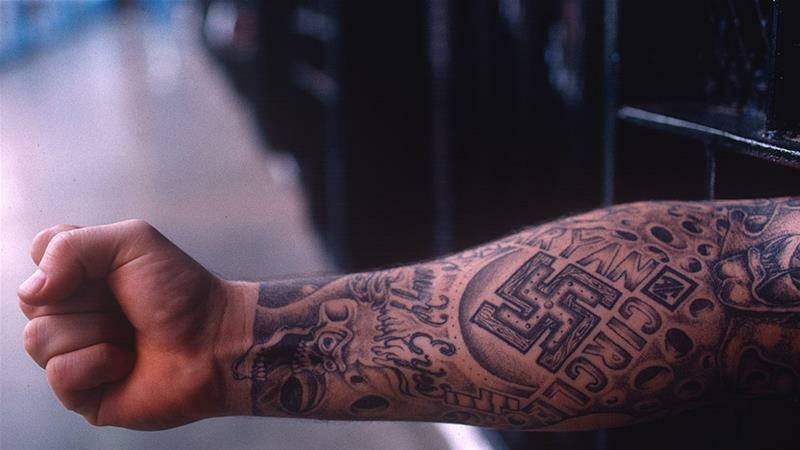 Such gangs glorify racial violence and incorporate Nazi imagery into gang tattoos. In addition to drug charges, in the past, such groups have been found to be in possession of counterfeit bills and illegally altered weapons: a sawed-off rifle, and another weapon with an obliterated serial number. Sawing off the end of a long-barreled gun like a rifle allows users to hide it or use it at close range. Destroying a serial number makes the weapon harder to track. Surprisingly, such gangs keep largely out of politics. They’re drug pushers and murderers for hire. The law enforcement agencies want to end the reign of such cults groups because this will result in at least three benefits: the end of racial attacks on unsuspecting innocent people, reduction in drug-trafficking, reduction in the probability of civil unrest and consequently a lessened threat to national security. There are multiple groups like the NAE spread across the land. In order to defeat them, the law enforcement agencies need to move in at them at the same time, with coordination at a national level, with proper intelligence. Due to the evolving nature of the groups, the time gap between gathering intelligence and launching the operation must be extremely small. In order to achieve this, the agencies must use a standard platform, share information, be able to screen suspects quickly, be able to gather useful intelligence quickly. All this is possible only with the use of modern technology. Brainwave Science is a company based in the United States which presents a technology called iCognative. This technology has the potential to revamp intelligence gathering for all sorts of agencies, such as those which deal with national security, border security, immigration, counterterrorism, law enforcement, human and drug trafficking. Gangs like the New Aryan Empire strike at will, are largely a criminal organization, target a group of people, are proud of their actions, are involved in trafficking, identify with an ideology in order to justify their actions, are likely to attack repeatedly without remorse, and are a threat to peace and society. For this reason, they must be dealt with in the same way as a terrorist organization. iCognative tests are instrumental to determine the level of involvement in terrorist activity, whether directly or indirectly. They help to verify the hierarchal and leadership structure within criminal organizations. In a iCognative test, words or pictures relevant to a crime, terrorist act, terrorist training, or other significant events are presented on a computer screen, in a series with other, irrelevant words or pictures. A test subject is made to look at these inputs/stimuli. The subject’s brainwave responses to these stimuli are measured non-invasively using a headband equipped with brainwave sensors. A computer program then analyzes the data to determine if the crime-relevant information is stored in the brain. A iCognative test does not evaluate whether the investigator’s account of the crime is accurate, or whether the relevant knowledge correctly represents the crime. iCognative does not detect guilt or innocence. iCognative does not detect whether the subject committed the crime or not. It only detects if the subject is familiar with the relevant knowledge which is being tested. In the iCognative test of the members of the New Aryan Empire group, stimuli such as images of Nazi and white supremacist insignia, details of previous crimes, known persons and places involved in the drug supply chain, known locations of meth labs, known suppliers and buyers of guns, incriminating details about the person whose face was slashed by the group etc. iCognative can be the crucial intelligence gathering and screening method which can help the investigating agencies collaborate across towns, counties, and states in order to bring down racist groups and decimate drug and gun trade in the United States of America.